I am Mark Pere Madrona, a Masters of Arts in History student from the University of the Philippines-Diliman. I earned my degree in journalism from the same school April last year. I am writing this letter to call your attention regarding one of the stories the paper ran last May 22, 2011. 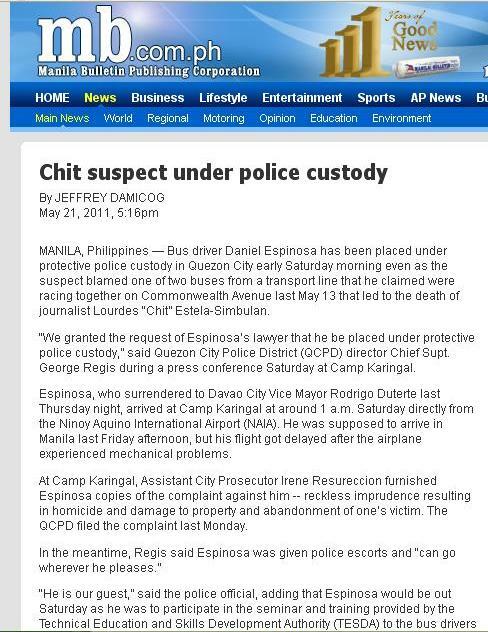 I am referring to the news article “Chit suspect under police custody” written by Jeffrey Damicog. The story can be found here: http://www.mb.com.ph/articles/319273/chit-suspect-under-police-custody. The report tells about the surrender of Daniel Espinosa to police officials the previous day. He is the driver of the bus that rammed into the taxi where UP professor and veteran journalist Lourdes “Chit” Simbulan was riding in last May 13. Chit suspect? What is that? Prof. Simbulan used to remind our class to avoid confusing headlines. In this case, what does “Chit suspect” mean? The editors may have managed to shorten the headline, but what about the need for clarity in news reporting? It should have been “Driver in road mishap surrenders” or something like that. The said article also indicated that the fatal accident happened “on the night of May 6,” when it in fact happened a week later. And I thought journalists must always get their facts straight!